When your water heater flakes out on you, it doesn't take very long before you are REALLY missing it. Give our water heater pros a call. We can send a technician out usually same day! All manners of nasty can clog up your drains, and we know exactly how to swiftly and carefully get your drains cleaned out and everything back in working order. It's in our company DNA! How long can your family survive without a working toilet? Right, didn't think so. When your toilet is on the fritz, call the plumbers who know toilets and pipes the best - Roto-Rooter! Roto-Rooter Plumbing and Drain Service is a full-service plumbing repair company. We offer 24 hour plumbing repair services because we know that your worst plumbing nightmares can happen at any time of day or night, so we’ll be ready when you call! Our company started out with a simple task, to clear tree roots thirsty for water from any source from residential and commercial water pipes. This issue was common in both urban and rural areas, for businesses and homes alike. It was our singular mission to keep water lines free of roots that can clog and eventually block them completely. When our predecessors learned how to do this effectively, our success story began, and it continues today. The first Roto-Rooter machine was made from a washing machine motor, thick cable, and roller skate wheels. To say the least, they were humble beginnings. No matter what, though, the ingenuity of a few brought Roto-Rooter Plumbing and Drain Service from those simpler times to build a company that now spans all 50 states and offers dozens of services for all your plumbing needs. Our company has grown exponentially, with locations all over the United States and services that range from indoor to outdoor problem fixes. We do residential and commercial drain cleaning. This can include problems with your faucet, sink, toilet, shower, tub, water lines, disposals, water heaters or septic tank. No repair is too challenging for our ace technicians. They will tackle clogged pipes in any scenario because we provide them with the right tools and knowledge to get things running smoothly again. We provide a full scope of residential and commercial plumbing services. 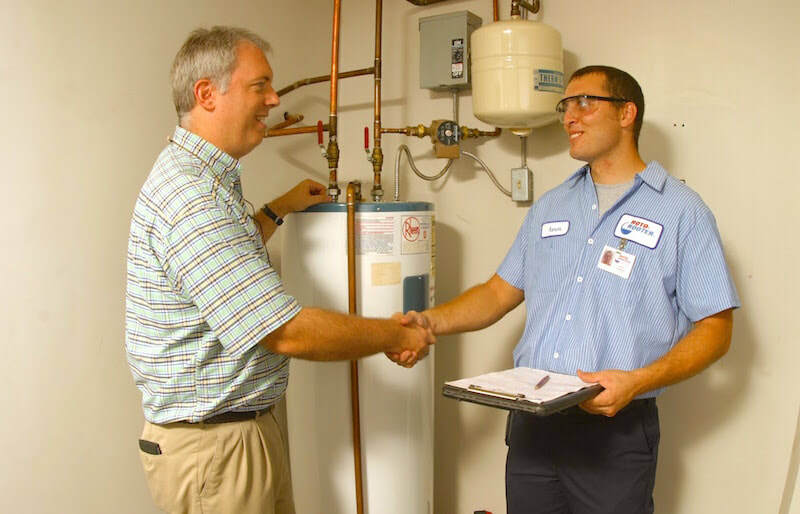 From just one service, our list of residential and commercial services has now grown to include inspection, repair and installation of hot water heaters, including gas and tankless varieties. We’ve also become experts in garbage disposals, water leaks, sump pumps and, of course, all septic system issues. It has been our mission to become the United States’ first choice for plumbing problems, equipment installation and inspections. We believe that we have achieved that goal, and if you’ve never used Roto-Rooter before, we’d love to prove to yet another new customer that we’re the best in the business! Our equipment has come a long way, too. Back in 1933 when the first Roto Rooter was invented, founder Samuel Blanc could never have imagined the powerful industrial-grade equipment that we use today. We have a variety of sizes to accommodate any job. After assessing the issue you are having, our certified technicians will choose the right sized machine for the job. Many people assume that they can rent a sewer-cleaning machine and save some money by doing the job themselves, but most don’t realize that these machines can be quite dangerous. They have sharp blades on the ends that can easily slice through thick tree roots, so it stands to reason that they could also seriously injure the user. So although it may be tempting to try it yourself, only a trained and certified technician should operate one of these powerful machines. You won’t have to worry about injury or property damage – on top of your septic or water problem – when you let our trained technicians come to the rescue. 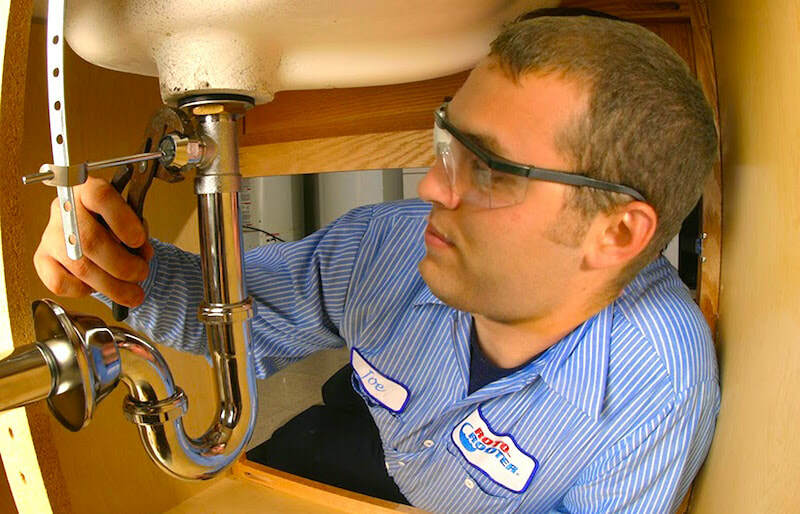 At Roto-Rooter, we hire only the best service technicians and plumbers, all fully licensed and insured, because our customers are our number one priority. We employ first-rate service people to assure our valued customers that your home is worth protecting, and we only trust the most highly qualified professionals in the business to take care of your property. These technicians and plumbers have a combination of experience and training under their belts, making them the most qualified people to work on your plumbing. Did you know that Roto-Rooter can can also install, repair and replace equipment in your home or business? Not only can we keep your water lines clear and fix drainage problems, but we also work on your equipment and appliances before there’s ever a problem with them. We do all manner of installations and inspections as well. In fact, we routinely repair and install household appliances such as dishwashers and water heaters. Any appliance that needs a water hookup should be installed by a plumbing professional to be sure that it’s water source is sealed and working properly. Roto-Rooter will gladly come out and install one or all of your major appliances, from your washing machine to your refrigerator. Think about all the places in your home that have running water. The bathroom, kitchen, and laundry room come to mind immediately, but do you think about the basement, the outdoor water hookup, or the water heater? If not, you may have no idea that one of these areas is giving you problems until it’s way too late. You need to keep a check on all water sources in your home or business so that you can spot small issues before they turn into much bigger ones. You can call your local Roto-Rooter the moment you notice a problem, and we’ll be out in no time to get it taken care of. However, we realize that some problems seem to pop up overnight – or in the middle of the night. When you need help fast, we’re also the company you can call! 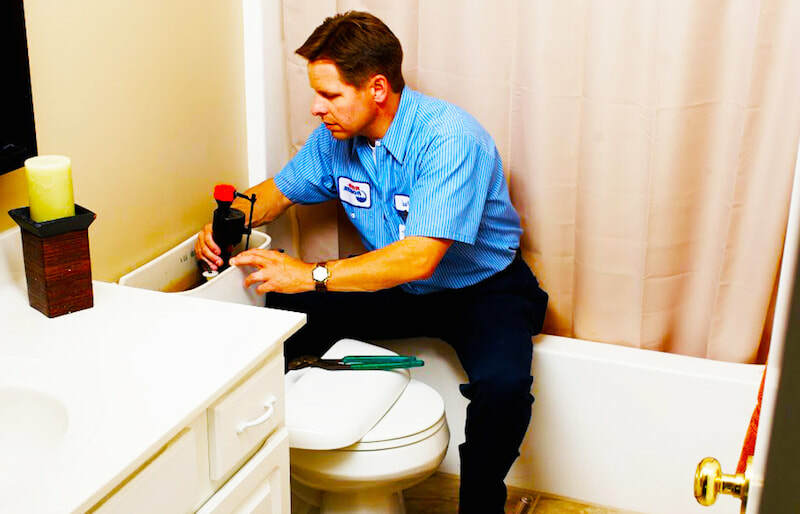 Any time day or night, if you’re having a plumbing problem, Roto-Rooter can solve it fast and prevent any future damage to your home or other property. We're THE Name That You Can Trust. your pipes, we can handle it! Homeowners and business owners alike are relieved to learn that we are one of the nation’s only 24 hour plumbers. This means that Roto-Rooter is available for regular and emergency services during normal business hours and after-hours as well. The peace of mind that you’ll have knowing that Roto-Rooter is only a phone call away is priceless. Chances are, you spend a lot of time and money taking care of your home. When an unforeseen water issue threatens to damage or destroy part of your home, you want a plumber who will give your home the same time and attention that they would give their own. Your home is important to Roto-Rooter, and keeping it in great shape is a top priority of ours! We guarantee that our technicians will respond quickly and work hard to repair your plumbing issue so that you don’t incur any more damage waiting for the problem to be fixed! Also, our technicians won’t stop until they get to the root of the problem. There’s nothing worse than companies that try to put a band-aid on big problems to avoid the cost and effort it would take to fix it the Roto-Rooter way! Homes and businesses are different, obviously, which means that servicing them will mean different things for us as well. Your business is your livelihood, so it’s crucial that you find a plumber that’s not only good at what they do, but you also want someone who can work fast and unobtrusively whenever possible. These things are important for homeowners’ comfort, but they are vital for a business owner who can’t afford to lose profits due to a plumbing problem. Businesses can also benefit from our services that are specially designed for them. For instance, we can inspect and clean the grease trap or do video camera pipe inspections to see what we’re dealing with before we ever disrupt a minute of your operating time. If you own a restaurant, some other customer service business, or a retail store, you know that appearances can go a long way. You’ll be pleased to learn that Roto-Rooter also does water damage restoration, so if your walls, floors or ceilings have some unsightly water damage after the repairs have been made, we can finish out the job by restoring these surfaces as well. For anyone who needs our services, we have convenient ways to schedule an appointment. You can either call our office, or you can make an appointment online with our quick and easy scheduling system. We want to make your plumbing situation – from emergency to routine inspection – as simple and as stress-free as we can, and it all starts with that initial contact for your appointment. No one makes scheduling easier than Roto-Rooter! Since 1935, Roto-Rooter has been an household name. Besides our exceptional 24-hour emergency service, people have been trusting us to care for and protect their homes and businesses because we are reputable, always giving 110% for each and every job. In addition, we are fully licensed and insured, so that your home is protected from any and all damages, no matter what causes them. ​Free estimates are also attractive to customers. Roto-Rooter has a policy that all estimates are free for customers in order to build trust with our clients. After an inspection and estimate, you are under no obligation to use our services. This gives you the freedom to look for better rates or higher quality service from another company. If you feel like you find a better fit with another company, Roto-Rooter will respect that right, although the vast majority come back to us because they quickly realize that we are superior in every way: service, products and people! We've been around for a while! Don't go for a fly-by-night service you found on Craigslist... Need some proof of how long we've been doing business? Check out this video from our Youtube channel! Just had a new tankless water heater installed in our home. Roto-Rooter did a great job and I'm excited for the savings! With roots creeping in to our drain lines on our septic I was sure I was in for a doozy... Roto-Rooter was the best priced and definitely got the job done right the first time. We had a persnickety toilet that always seemed to be clogged...the guys from Roto Rooter replaced it and in the process earned our business for life!